The show playing this week at the Ford Center for the Performing Arts/Oriental Theatre may be called “Three Mo’ Tenors,” but it’s actually a tale of several more. The first three are, of course, Jose Carreras, Placido Domingo and Luciano Pavarotti, whose success in “The Three Tenors” concerts were the inspiration for “Three Mo’ Tenors”–classically trained African-American singers who perform in various styles. But the original Three Mo’ Tenors now perform under a different name, reportedly after disputes with their management. Diggs, Kenneth Gayle and Marvin Scott. But wait: there are three more Three Mo’ Tenors: James Berger, Duane A. Moody and Victor Robertson alternate throughout the week with the first group. The two casts perform in rotation to accommodate the vocal demands of the show. With all that, it’s impossible not to like the show. A nearly full house at the Ford Center cheered and stomped in delight, and for good reason. The piano accompanist, Victor Simonson, also led a combo, seated on stage, of synthesizer, bass, sax and drums. A choral group joins the soloists for a rousing gospel finale. The variety of performers suggests a variety of musical styles, which is exactly what you get. The tenors offer opera, Broadway hits, blues, jazz, spirituals, soul, even hip-hop–convincing in all genres. The word opera was not on the Ford Center marquee, though there was ample room for it. As for style, the voices of Carreras, Domingo and Pavarotti were recognizably theirs whatever style they were singing in. But the voices and personalities of the Three Mo’ Tenors were transformed as they entered each style–different from their opera offerings but always engaging. Opera, coming at the beginning of the show, included “La donna e mobile” from “Rigoletto,” done whimsically in the style of the original Three Tenors in that the single vocal line was divided among the trio. Solo arias from “Tosca” and “Manon” and a Rachmaninoff song performed in Russian followed. With the serious stuff out of the way, matters became very light. Homage was paid to Jelly Roll Morton, Fats Waller, Gladys Knight and the Pips and others.Although the show runs under two hours, with one intermission, you get your money’s worth. 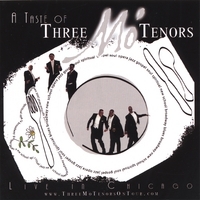 “Three Mo’ Tenors” plays at the Ford Center, 24 W. Randolph St., at 7:30 p.m. Thursday; 8 p.m. Friday; 2 and 8 p.m. Saturday, and 2 and 7:30 p.m. Sunday. For tickets, call 312-902-1400.